Who is this creepy monster? colour in this made-up monster to celebrate Halloween, a costume party, or just for fun. When you're done, see if you can create your own crazy creature! There is something wicked coming to town... it's Frankenstein's monster! 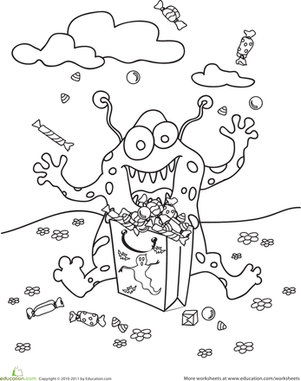 Celebrate Halloween with a fun coloring page. The glopp blob monster looks angry! Help cheer him up by adding some bright colors to his slimy coat.